Happy New Year! This month’s Chronicle of news and information starts a new year and transitions the leadership of CSN. 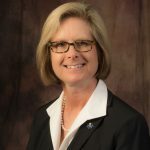 At the end of this month, Dr. Margo Martin formally assumes the position of acting president of CSN, and during the month, she and I will continue oversight of the college. Dr. Martin continues to be grateful for the confidence that the Board of Regents, the chancellor, and the CSN faculty and staff have placed in her ability to lead CSN during this important transitional period. 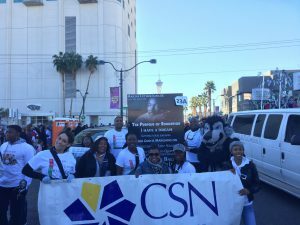 She has pledged that CSN will continue to actively engage with our local schools, our college and university partners, and business and industry stakeholders to develop streamlined, guided pathways that lead to dual-enrollment credit, skills certificates, degrees, and gainful employment for Nevada students. 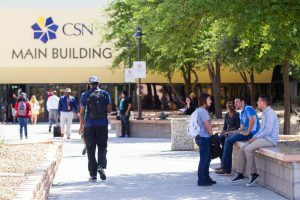 The first meeting of the Board of Regents presidential search committee and the advisory committee is scheduled for 1 p.m. January 8 in the June Whitley Student Lounge on the North Las Vegas Campus. The meeting will also be connected electronically to the Charleston Campus, Building H, Room 105, and the Henderson campus, Building C, Room 224. This is a public meeting and I encourage you all to attend. The Board of Regents has scheduled open forums on each of our campuses on January 25 to discuss tuition and fee changes for the 2019-20 and 2020-21 academic years. Chancellor Dr. Thom Reilly will join representatives from the institutions and student groups to discuss proposed tuition and fee increases. All are welcome to attend. Resident and non-resident tuition and fees will be under discussion. NSHE officials are soliciting feedback on the proposal, which will be presented to the Board at its March 2018 meeting and voted on at its meeting in June. I want to offer my sincerest thanks to our Nevada Promise team for their hard work over these last several months, taking in scholarship applications, recruiting mentors and making sure the process went as smoothly as possible for everyone involved. There is much work to be done before the first crop of Nevada Promise students enroll at CSN next fall, but our team is up to the task. I also want to thank the hundreds of southern Nevadans who signed up to be mentors, including many from right here at CSN. As always, our success is a team effort. Classes for the spring 2018 semester begin Tuesday, January 16. Remember, registration is open now, and late registration will remain open through Jan. 22. On the first two days of the semester, we traditionally have Welcome Back Crews out on each campus to help students figure out where they are going and to assist with other problems that may come up. This semester, you will notice a slight difference. In order to better help students, we will have crew members strategically located in various parking lots around campus, rather than in front of or inside buildings. We hope to catch the students before they get lost, rather than after. Join the CSN Black Student Union and the African American Heritage Committee for the Martin Luther King Jr. Parade at 10 a.m. January 15 in downtown Las Vegas. CSN has participated in this parade for the last several years now. There will be an information session for students looking to learn more about CSN from 3-5 p.m. Jan. 9 on the Charleston Campus, B-102. 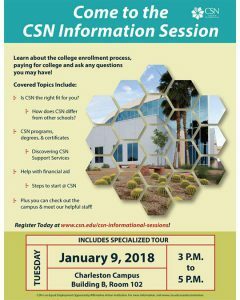 Topics to be covered include what makes CSN unique, an overview of our programs and support services, and financial aid. Pass the word along. 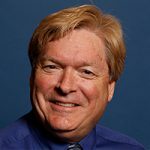 Please join me in congratulating Professor Scott Burton, who was recently appointed by Gov. Brian Sandoval to serve on the Nevada Sentencing Commission. The Commission, created last year by the Nevada Legislature, is charged with developing policy recommendations and best practices related to criminal sentencing in order to reduce recidivism and promote education, vocational training, and rehabilitation for criminal offenders. As you know, the employee giving campaign is ongoing until Feb. 23. Participants will receive a special pin and will be entered to win exciting raffle prizes. Look for more information about these opportunities after the holidays. Go to www.csn.edu/foundation to find out how you can make your Coyote Commitment. 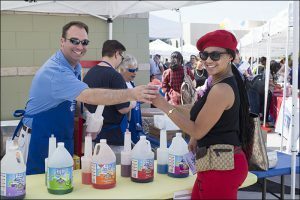 Remember that contributions to what’s called the ‘unrestricted fund’ are used to support CSN events or activities, including the annual Science & Technology Expo and general scholarships for low-income students. 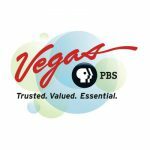 Join Vegas PBS and the CSN Foundation on Jan. 24, from noon to 2 p.m. to learn about establishing wills and trusts, the benefits of planned giving and how to protect your legacy. We’ll also discuss the administration of trusts. This complimentary seminar will be led by Vegas PBS Planned Giving Council members and Estate Attorney Robert L. Bolick and Trust Officer Mark Dreschler. Bolick will provide important information about drafting a will and setting up a trust and how to avoid problems that can arise without proper planning. He will also explain how you determine if a will or trust is right for you. 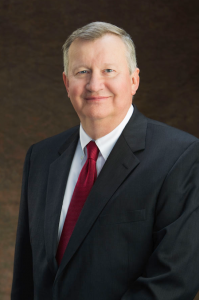 Dreschler of Premier Trust will highlight the fiduciary responsibilities of an executor and/or successor trustee as it relates to the after life administration of your affairs. Lunch will be provided (must register) and questions are encouraged! For more information, click here. To register, contact Lana at 702.799.1010 x5577 or at lprusinski@vegaspbs.org to reserve your complimentary seat today! As I reflect on these past years as president of CSN and prepare this note of farewell, it is hard to find the words to convey all I feel about this wonderful institution. I think of the special moments, milestone events and, most importantly, the extraordinary people I met along the way — on our campuses, at our learning centers, and throughout the community. I extend to each of you my deepest thanks for your support and encouragement during my tenure as president. My fondness for the college and for you will ever remind me of this marvelous institution and its thoughtful, passionate and courageous faculty, staff, and students. Thank you for allowing me to serve. 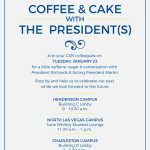 This entry was posted in Monthly Chronicles and tagged Nevada Promise, presidential search. Bookmark the permalink.